Say no to Aerial Predator Extermination in Alaska. I read yesterday afternoon of a couple of pieces of legislation currently under consideration in Alaska that concern me greatly. Bill SB 176 and bill HB 348 are proposals by the Alaska Board of Game that prepare for a mandate by the Board of Game to pursue what they call “aerial predator control programs” of wolves, brown bears and wolverines. SB 176 is an attempt to give the Board of Game free reign over the decision making process, with no requisite consideration of input from the scientific community – i.e., if the folks on the Board feel like mandating aerial shooting, or den killings of wolf pups, they need show no concern or evidence of supporting scientific study. HB 348 is a proposal to shift wildlife to a category they call “public assets”, which includes minerals, oil, and so forth, effectively removing them from public voice. This means the Board of Game can then make decisions such as aerial shooting with no input from or responsibility to the people of Alaska. I’ve written to local legislators here in Alaska on this issue, and I thought I’d post an amalgam of my letters here. I am writing you with great concern, regarding the current proposed legislation, specifically SB176 and HB 348. The proposals, as we all know, are simply an attempt by the Alaska State Board of Game to avoid a repetition of the rather unfortunately necessary embarrassment of being sued for failing to comply with their own mandates and laws. The Board of Game’s wish to impose and allow airborne and same day airborne aerial predator exterminating runs contrary to long-standing and respected hunting traditions. The Board of Game’s wish to make decisions without due and careful study, without consideration of the best available sound science is, at best, narcissistic, more probably negligence and gross malfeasance. Any decisions of environmental management must consider and value the best available sound science over the whims of a few people granted political postings. We saw recently how effective management is coming at the opposition to available science when the Board of Game went ahead with a decision to allow wolverine trapping in the Chugach State Park. Local biologists recommended against it, on the premise that wolverines were scarce in the area, and also that pets would likely fall victims to the traps. The trapping season came to a close and in all of 1 900 square miles, only 2 wolverines had been caught, along with 6 pet dogs, one of which died, another nearly died, and 4 were injured. Such is the efficiency of current management policy making when it denies best available input from the scientific community. Of equal importance here is the issue of accountability. The Board of Game’s intent to remove the potential for any further litigation against them is unacceptable. Political decisions must, like all choices we make, come with responsibility and accountability. The Board of Game are flagrantly denying basic principles of a democracy. Proposing that their own opinion of the time is reason enough to make decisions that flout the opinions of their state constituents is not a basis for any reasonable system of government, and certainly does not belong in the institution of American Politics. Governor Palin touts transparency as a critical structure of her government. Well, this is as transparent as it gets – I’m certain the Alaskan voting population, as well as the hundreds of thousands of tourists who spend their vacation dollars in this state every year can see right through this farcical and completely unacceptable proposal. Government officials must be accountable to the will of the populace they represent. The Board of Game MUST be required to show any and all factors affecting their decisions, they must be required to reflect conclusions of examined and peer-reviewed sound science that informs their decisions. Policy must be supported by, and reflect, the best of information, not the egos and outdated Neaderthallic ideologies of a few. Constituents must have opportunity for input, as well as full legal recourse for failing and unreasonable policies. In the interest of Alaskan tourism, of Alaskan community, human and non-human alike, SB176 must not be adopted. HB 348 is an affront to the fundamental principles the laws of this country are based on. The “will of the people, of the people, for the people” does not contain the word “regardless” in it. The people of Alaska have spoken, clearly, emphatically and repeatedly they do not want the wildlife of Alaska to be declared a “public asset”. By the Board of Game’s own game management law, the intent is to “reallocate the harvestable surplus of game animals from predators to humans”, and yet they simultaneously intend that the “people” are removed from decisions regarding that allocation, that the will and clearly communicated desire of the people is not just ignored, but opposed. Alaskan citizens have voted against aerial predator control twice now, and requested proposed initiatives to vote it down yet again, and the Board of Game, in all their suited and veiled arrogance, are attempting to wrestle even this opportunity out of their reach. To deny the constituency even a voice in policy-making is as un-American as bad Apple Pie. I sincerely urge you to consider the long-standing traditions of accountability of a land and place-based hunting ethos, of democracy and decent community and vote down HB348. The Board of Game currently has no members who represent a non-consumptive viewpoint, and hence the policy they initiate do not reflect and promote the will of the Alaskan Constituency they belong to. It remains to be seen if her government legislates accordingly. 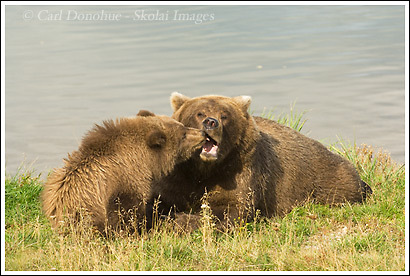 This entry was posted in Alaska, Environmental Issues, Grizzly Bears, Katmai National Park, News, Rants, Wildlife on March 12, 2008 by Carl D.
I am really glad you sent those letters. From what I’ve read about the Government in Alaska, from the Governor to the ADFG, they seem to be woefully inadaquate & just plain stupid about many aspects of their “game management” programs. It sure seems to me that good common sense doesn’t seem to rule there. I’ve e-mailed the ADFG before about other issues & never gotten a response, which doesn’t surprise me. Keep giving `em a big shoutout, Carl!! I definately agree!! I understand they want to increase moose and caribou populations, but doing so by removing natural predators doesn’t seem to have much of a record of achieving that. I have lived in Alaska the past 51 years and watched the relationship between the amount of moose, caribou and wolves. In the 1970s, the first political pressure was put on Alaska to end arial hunting of wolves. The number of moose and caribou were reduced by several hundred percent within 5-10 years. Amazingly, the wolf population increased dramatically as arial wolf hunting was banned, but after nearly all the moose and caribou were slaughtered by wolves, the wolf population then also took a tumble as there was little left to support the wolves. In the early 1980s a limited amount of wolves were taken by Fish & Game helicopters and the moose and caribout populations began to come back. Thereafter the wolves began to increase again. Left to its own course and end, (that is no management), persons on both sides end up a loser, with few wolves and few moose and caribout to feed them. We can either wisely impliment sufficient pressure to maintain a healthy balance that results in a large moose and caribout population and a moderate wolf population, or we can let nature take its course, leaving very few wolves and few moose and caribou. Wolves do not self manage. They kill out of instinct. It is their thing to do day in and day out. They kill whatever big game is available and if already full, leave the meat lay untouched. I have witnessed this first hand and have spoken to many others with first hand experience as well. Management makes a lot of sense for both those who enjoy wolves and those who enjoy moose and caribou. I believe that the scientific studies referred to by Governor Palin support precisely what I have tried to print in simple laymnan’s terms. I hope that all will seek to become better educated on the subject before making an assumption that the Alaska Department of Fish & Game is in the dark ages. Thanks for reading, and for a detailed post, I appreciate it. It’s great to have some long-time Alaskans on the site! Removing all reference to “Science” means, they have free reign to essentially act on their own opinions. For a Government currently advising that their predator-management program is science based to remove the word “science” from their law seems contradictory to me. * the 2nd issue is the will of the people. The Alaska populace have voted twice in the last few years to deny aerial wolf shooting. They initiated a petition for a third vote on the ballet this coming August, and the proposed bill HB 348 removes that initiative, and removes all further input from the Alaska citizenry by classifying Fish and Game as “Assets”, meaning their “management” is no longer something the voters have any real say in – just like oil, mining, etc. Alaska Game Management should, IMO, require sound scientific input, as well as be held accountable to the will and scrutiny of the public. These 2 bills are proposals that afford neither of these. A separate, though related issue, is the issue of predator control at all. Moose were not historically in large numbers in Alaska, and didn’t inhabit many regions of the state until relatively recently. Some 600 moose are killed on the Alaska roads each year. Fire control has prevented the regrowth of willow that moose browse on, lessening available habitat. Wildlife populations naturally fluctuate – that fluctuation is probably the key to their survival. The snoeshoe hare/lynx relationship is a classic example of that. Attempts to artificially stabilize populations are, at best, dangerous, more likely to be very damaging to processes such as natural selection, genetic diversity and overall biotic health. Artificially inflating moose populations above the natural population has been shown to affect overall body size and reproduction, as they become more competitive for limited available food. A big issue in this topic is locale. Moose populations in some areas of the state are high and increasing, and in others noticeably decreasing. The Tanana Flats area in particular has seen moose populations fall, but studies have also shown yearling moose in that area to be of significantly less body weight than moose calves who browsed in the Alaska Range region, despite similar birth weights – this indicates food and nutrition to be a factor. Have you read Jim Rearden’s book, “Alaska Wolf Man”? He’s an ex- Board Member, and definitely of the ‘wolves need to be shot’ ideology. I don’t recall the specifics, but there are a number of fallacies, inconsistencies and bad logic in that. Bull moose numbers were down, and he said this indicated predation by wolves and bears was an issue, when we all know if the bull-cow ratio is down, it points, most likely, to over-hunting by people, not wolves and bears. Further, and this a problem with much of the idea behind predator control, the populations of moose and caribou that are targets for restoration are from years of historical highs – after years and years of predator extermination, by trapping and shooting. When aerial shooting was banned, in the early 70’s, a few severe winters (71/72 and 72/73 in particular) resulted in sharp declines in moose populations. The argument became that wolves needed to be shot out because moose and caribou populations would be low otherwise – the truth seems to be that because of concentrated and widespread predator extermination programs, moose and caribou populations had been artificially inflated. As aerial wolf shooting was banned, the ungulate populations crashed because (a), they’d overeaten their habitat, (b) severe winters, and (c) predation. Restoring moose and caribou populations to those peak populations is probably unsound management, as well as impossible. I’ve been fortunate enough to see a few wolf kills in my travels in Alaska, and I’ve never seen them leave a meal without getting their fill first. They typically return to a kill and finish it off quickly, and in a day or so, a few bones is all that remains. Wolf kills also are scavenged by bears – so a decrease in the wolf population will also affect a food source for bears. I firmly believe natural predators have a record of better management of prey species than we do, even with our best available science. The health of ecosystems across the US when Europeans first arrived here would seem to support the idea that wolves and bears know better than we do what a healthy ungulate population should be. The ungulates, in turn, seem to have a better idea than we do of what a healthy population of bears and wolves should be as well. We might do well to learn from them. I’ve never seen any supporting data that wolverines are a threat to either caribou or moose populations, though I have seen one chase Dall sheep. He didn’t catch any though. I can’t see why aerial wolverine shooting needs to be a part of any bill. Thanks again for your post, I do appreciate it. Humans attempting wildlife management always puts a picture in my head of a cook trying to prevent several pots of boiling water from spilling over by ladling one into another. In the end, they all end up spilling over. Let’s face it, we are not very good cooks! Thanks for your response. It is evident that you understand the dynamics of the wolf, moose and caribou ratios which is preceisely the science behind any management principles employed. What I think we disagree on is the purpose of management. Maybe we can agree to disagree here. In my view, management should include the purpose of maximizing the number of moose, caribou and wolves and, (with consideration of the available habitat and feed), that yields the greatest use and enjoyment by tourists and locals alike. It is fun and encouraging to see lots of moose and caribou and an occasional wolf or wolf pack. Left alone, (without management), the ratios work out naturally, exactly as you stated and know: left with very few of any of the named species and consequently, very few persons would enjoy seeing such animals. As with any natural resource, wise management and careful planning, can result in benefit to all. Animals do not self manage for maximization. They self manage to their own deteriment including at times natural extinction. I have observed wolves on many occasion, including wolf kills of moose calves left to rot without a single bite taken. How often this occurs is debateable, but wovles kill because that is their instinct and occupation, not necessarily for food and certainly not for management or conservation purposes. If the purpose of the Department of Fish & Game is to isolate, conserve, leave to their own fate, ignore or simply preserve all natural processes, then your conclusion is right. With that scenario, we would abolish the Department, because who needs one? Just let the animals do thier own thing and count your self lucky to see a moose, caribou or wolf every few years. That is certainly not my idea of fun or enjoyment, nor is it the Alaska that I know and love. Thanks for the input, I do appreciate it. I agree with everything you wrote. I think there are a few areas here that I see potential problems with. The idea of “maximizing the number of moose, caribou and wolves” is fraught with potential concerns. One might be, for example, the impact of those species populations on other species. For example, moose eat willow, a staple and and critical part of the diet of Snowshoe hare. Snowshoe hare are a vital part of the diet of a number of predators, particularly Lynx, owls, foxes, coyotes, marten, wolverine, etc. “Maximizing moose” numbers could easily lead to problems with available food sources for snowshoe hares, which in turn impacts a number of other species. To me, this kind of thing shows, as Mark alluded to above, that we’re incapable of fully understanding the implications of all these things on the rest of the biology. Even now, after years of study and research, biologists in the Greater Yellowstone Ecosystem, biologists are amazed at how much impact the return of the wold has had on so many different aspects of the biotic community. Beaver numbers have returned to healthy populations, for example – nobody had any idea beaver would benefit from the wolf’s return. Pronghorn numbers are increasing, bighorn sheep an whitetail deer are increasing as well. Secondly, I think we have to question our role, our responsibility and our right to “manage” all this. “Playing God” is an ethical consideration. Concerning the idea that without human ‘management’ species populations are reduced to ‘very few’, I don’t think biology studies reflect this. Most species’ populations follow a bell curve .. from a low and slow start, they begin to gradually increase .. slowly, as the species learns its habitat, ecosystem, etc. Population then begins to rise at a faster rate, as the species begins to become more successful. After a while, the growth rate slows as it begins to approach carrying capacity. The moose in parts of Alaska such as the YK delta are a great example of this. A century ago, there were no moose there. Maybe 60 or so years ago they began to appear in the delta, and gradually at first, numbers began to rise. Once established, the population rose markedly. Then it approaches peak, or carrying capacity, and population growth rate slowed and began to level out. All of this was also affected by the extensive predator control programs Alaska had in place during much of that time. If we look at species populations of this continent before European arrival, I think you’d agree that left to their own management, species seemed to able to flourish, far better than they do under our ‘management’. Approximately 100 million bison walked the Great Plains. Another 40-60 million Pronghorn walked the Great Plains. Salmon ran so thick in the Pacific Coast Rivers that reports of horses being to fearful to enter the water, so great was the trashing and splashing the fish caused. Estimates of the Passenger Pigeon population are around one billion. And it’s not just animals. Forests were were so thick on the Appalachians that the mountains appeared covered with snow with the American Chestnut trees sprouted their creamy white blossoms. And it’s not just populations. Wood bison walked in New England. Polar bears were recorded to have travelled as far south as Delaware Bay. Virtually every animal native to this continent roamed a far greater territory than they do today, and in greater population densities. I just don’t agree that we, even with our best science, can understand enough to ‘manage’ populations any better than they’re able to do themselves. I’d go so far as to say the intention o do so reflects probably one of our greatest problems – a desire to control that which we have no right whatsoever to control. I can’t think of many examples of species ‘self managing to the point of their own extinction’. I can think of many, many species who were driven extinct by mankind though – some populations continuing to be decimated today. IMO, the role of a department like Fish & Game ought be to manage the (human) hunters, and monitor our impact on the landbase we live on. I’m not opposed to hunting, even, in some way, to sport hunting, but I think we need to understand that our right to this world is no greater than that of the fellow creatures we share it with, that the more respect and compassion we show the natural world, the more respect and compassion we inevitably have for ourselves – we are, afterall, a product and a part of that world. I do think we have a right to ‘use’ (though I dislike that word) what the landbase provides us with – we’re living creatures, and not exempt from the laws of consumption. But rights intrinsically come with responsibilities. We have a responsibility to the wolves, to the moose, the salmon, to the tundra, to the forests, to the oceans, to ourselves, to treat the world with care. Rather than impose “management” on the natural world (an oxymoron, no – how ‘natural’ is something ‘managed’? ), I think we might do better were we to start caring about the natural world, which ultimately means caring about ourselves. Caring about ourselves enough that we act in such a way as to see plentiful populations of moose, caribou, wolves, wolverines, salmon, eagles, forests, flowers, clean waterways, clean air, and so forth. I agree with you, Carl. Yellowstone is doing much better, & I also agree that ADFG should really “manage” the people more than the animals. Case in point, which they have failed at miserbly: A MAN named Mr. Charles Vandegaw who continues to feed hundreds of bears on his property, even though they are fully aware of this dangerous situation. He not only puts his own life in danger, but that of his neighbors and many innocent campers & hikers. They even did a newspaper article on him. Unreal!!! Yeah, that crazy guy feeding bears is pretty wild. I’m not certain how much damage it causes, in reality, but it’s certainly a pretty wild situation. I’m not sure if he’s still feeding this coming summer or not.